What Happened to 'RINO'? Trump's Surge Flips the GOP's Script. HomePoliticsWhat Happened to ‘RINO’? Trump’s Surge Flips the GOP’s Script. How ironic, then, that Donald Trump is leading the polls in the Republican primary fight. 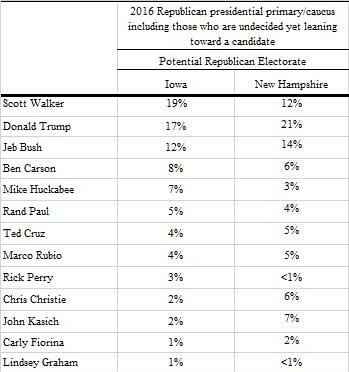 No matter who’s running the numbers, Trump is obliterating the competition in the party’s presidential nomination. And, though for a while GOP strategists could write Trump’s lead off as being only in “unimportant” early national polls, a new NBC/Marist poll shows that he is killing it in the traditionally important primary battleground state of New Hampshire, and that he’s within the margin of error (statistically tied with Scott Walker) for the lead in the seminal Iowa caucuses. You see, Donald Trump is literally, without a doubt, 100% a full-blown gaping RINO. Unlike McCain, Romney, Bush, and Graham whose conservative bonafides are proven and recorded in legislative action and voting records, Trump’s reputation isn’t at all deserved. As a matter of fact, he doesn’t really have a conservative reputation. Beyond his vitriolic stance on immigration, his positions on the issues that the conservative base of the Republican party hold dear simply don’t mesh with what they claim to believe. Trump is, depending on the year, pro-choice, pro-single payer (“universal”) healthcare, pro-gun control, anti-free trade, and at one time proposed “a one-time 14.25 percent tax on individuals and trusts with a net worth over $10 million” in order to bolster America’s ailing entitlement programs. He’s smeared one of America’s great war heroes. He’s donated a ton of money to the Clintons and other Democrats. He does, apparently, think climate change is a hoax; he’s also a birther. So there’s that. Putting all of that to the side, though, since when was a Republican electorate obsessed with fiscal responsibility, personal accountability, and “traditional marriage” okay with a candidate who’s been married three times and bankrupted four companies? It simply doesn’t make sense. Trump is running on the Republican ticket. He’s embracing the Republican label. He’ll even have a spot at the contentious Republican debates on FOX News and CNN. But his views don’t mesh with the Republican Party’s platform, let alone the beliefs of those on the RINO-hating right. Trump is simply using the GOP as another visibility platform. Another brand-recognition tool. And the Republican base is eating it up. The right’s intellectuals and commentators in the conservative blogosphere recognize this, and they’re not happy. Here’s Red State wringing its hands; here’s the National Review; here’s the Washington Times. FOX News and Wall Street Journal boss Robert Murdoch is even getting in on the action via editorial direction and a Twitter war. But it’s too late. There isn’t anything they can do. For the better part of a decade now the Republican party has pandered to its lowest common denominator. Riling up the xenophobes and racists must have seemed like a great plan back in 2008 when the nation’s first black president was elected and the Tea Party was in full insurgent mode. Even after the GOP lost its second presidential election in a row, and released an “autopsy” in 2013 explaining that it had to do better with minority voters and women, it must have seemed smart to hold on to that rabid angry white base and promote the pundits, like Trump, who appeal to them. All of those potential voters and, even better, all of that cash! Not only for the Republican Party, but for the media ecosystem that surrounds and feeds it: Breitbart, Red State, Fox News all cash in on the fears and insecurities of an aging rural demographic that places its blame on the “other” while overlooking the policies of the very party whose policies harm them most. Trump is the Frankenstein the GOP and its ilk have created, and now there’s little they can do but watch (and commentate) in horror as he shows the nation and world just how ugly their party has become. The base of the party, for all of its rhetoric, doesn’t care about RINOs. It only wants to break things. President Barack Obama was not wrong in 2008 when he said that Republicans “cling to guns or religion or antipathy to people who aren’t like them or anti-immigrant sentiment or anti-trade sentiment as a way to explain their frustrations.” Donald Trump is proving him right with every bump in the poll numbers.